Helen is a classically trained musician with an interest in all genres of music. 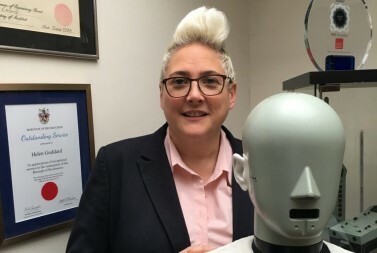 She joined AMS Acoustics in 1995 as a Junior Acoustic technician where she was introduced to the physics of sound, while continuing as a session musician and gigging with her duo partner. In 1998 Helen gained the IOA post graduate Diploma in Acoustics and Noise Control specialising in Electro-Acoustics. At this time she was made an Associate of AMS Acoustics and developed her specialism in Speech Intelligibility. In 2000 fate stepped in and Helen bought AMS Acoustics and took on the role of Principal and Managing Director. Helen has worked tirelessly to put together the exceptional team that is AMS Acoustics and was rewarded with a place in the “Who’s Who Business Elite” in 2008 and 2009. Having such an excellent team allows Helen to continue with her music which is now in the form of teaching Musical Theatre in a local Performing Arts charity where her youngest students are 3 and the oldest 70! For over a quarter of a century AMS has been engaged to work within the field of Mass Transit and Helen has been immersed in numerous assignments for London Underground and Network Rail. Another major area of activity has been within Airport concourses particularly Heathrow where AMS has prepared designs for all Heathrow sites up to and including The Queen's Terminal. Helen played a key role in the integration of the PA/VA design at the Arsenal Emirates Stadium and this led to further engagement at the London 2012 Olympics. AMS Acoustics was responsible for the ExCel Convention Centre development which became the Games only permanent performance venue. Adjacent to the Olympic Park is the Westfield Stratford Shopping Mall where AMS designed and project managed the entire PA/VA system throughout the complex. Apart from new build developments Helen relishes the opportunity to challenge more classical spaces which is perhaps best typified by the Great Court within the British Museum and the Barlow Shed at St. Pancras International station. These sites required extensive modelling and the application of the latest electro-acoustic solutions. Helen continues to support the industries governing bodies and regularly chairs proceedings at the IOA and ISCE gatherings. Beyond her domestic duties Helen has added further dimension to AMS with activity within overseas markets the impact of which can be seen with the development of wider export portfolio.